Easter bunnies chocolate galore and spring weather make Easter a fantastic time of year. Get crafty with some of these ideas! The kids are on school holidays and we all know what that means. After a few days even the best behaved little ones will be craving something to do. Here we have a selection of activities that both kids and adults alike can get involved in. Get cracking and make Easter a family affair. It has often been said that eggs are a versatile staple of any kitchen cupboard. Rather than scramble them for your breakfast, get creative. At Easter they form the key ingredient to some DIY crafts and games that will keep the kids entertained for an hour or two. Hard boil some eggs and once cooled, invite the kids to make little characters. All you need is some small circle stickers, coloured paper, ribbon, coloured marker pens and cotton or string. Get them to create whatever character they want to. A little bunny can be made by drawing a little nose and whiskers with a black marker pen, gluing on two little paper ears, using small circle stickers for eyes and putting a little cotton wool ball at the back for a tail. This is a cheap and fun activity so get their imaginations running wild! After you have made that nutritious breakfast, get some food colouring in a variety of colours and colour the eggshells. Why? It will all make sense very shortly! 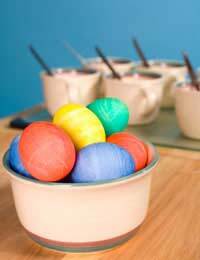 Get the kids to break up the eggshells into small pieces once the dye has dried. Then get them to draw an outline of an Easter themed drawing on an A4 piece of paper. A rabbit or an Easter egg are perfect ideas. Spread glue on the shape and then task the kids to sprinkle the coloured eggshells over the glue so that the whole shape is covered. Feel free to add glitter for an even more impressive end result! If the weather is holding up, get the kids lined up in the garden or local park and hold a relay race. All you need is some hard-boiled eggs and some spoons. Each child should get their own egg and spoon. Once they are all raring to go, give the cue: “Ready, steady and go”! The first one to make it to the end point with the egg still balanced on the spoon wins the race and a prize! An Easter bonnet is a tradition. Get your kids to make their own version. All you need is some coloured card, ribbons, marker pens, crayons, doilies and some dried or even real flowers. Cut a large circle out of the card – it needs to be big enough to form the base of the hat. Get the kids to decorate the circle as they wish. They can add flowers, stickers, glitter or the doilies. Get two pieces of ribbon and staple to either side of the hat. Place the hat on the little lady or boy’s head and tie under the chin. Get all the family members together for an Easter Sunday to remember! A treasure hunt is a great Easter activity. It can held in either your garden or in the house. All you need is some clues and a prize. For an Easter themed treasure hunt, make the clues little Easter eggs that lead to progressively bigger and better chocolate eggs! Children as young as 3 and adults as old as 90 can play this game! Make it as inclusive as possible – create picture-based clues, depicting places in the house. A picture of a kitchen cupboard, the shoe rack or the back of the garden shed will get their legs running around your property! Older children can face a greater challenge. Devise riddles to take them from clue-to-clue! Just as Christmas is for kids, Easter is also a great time for them to indulge. Adults needn’t be left out. They can get their fare share of chocolate and fun. Get creative and excite the entire family!